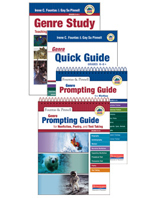 Fountas & Pinnell Prompting Guides are teacher tools for individuals or groups of students that provide quick and to the point prompts for teachers to instruct students in their area of need. 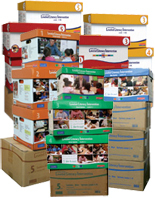 The Fountas & Pinnell Prompting Guide 1 is a flip-chart tool that you can use to enhance your teaching power in guided reading lessons; intervention lessons; shared reading; independent reading; reading and writing conferences; and dictated, independent, and interactive writing. If you are a classroom teacher, reading specialist, literacy teacher, Reading Recovery teacher, or literacy coach, you can use this flip chart as a ready reference while working with students in several instructional contexts. Fountas and Pinnell have compiled a comprehensive collection of precise language to use when teaching, prompting for, and reinforcing effective strategic actions in reading and writing. Based on your observations and analysis of students’ reading and writing behaviors, you can select the specific language that will work best for children as they build their literacy processing systems. The language in this guide will improve the reader’s or writer’s ability to solve problems and use strategic actions independently. 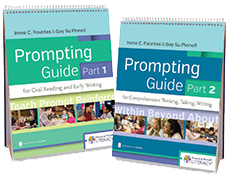 The Fountas & Pinnell Prompting Guide 2, for Comprehension: Thinking, Talking, and Writing contains precise language to use when teaching, prompting for, and reinforcing effective strategic actions in reading and writing. Classroom teachers, reading specialists, literacy teachers, and literacy coaches can use the flip chart as a ready reference while working with students in several instructional setting and contexts.